On 1st December 2014, Perbanas Institute received its latest highly sought-after certification from CPA Australia as one of the world’s largest accounting bodies with over 150,000 members spanning 120 countries. After careful deliberation by CPA Australia and several meetings held over the course of the year, the Bachelor's Honours Accounting programme was successful in meeting the organisation’s curriculum quality standards. 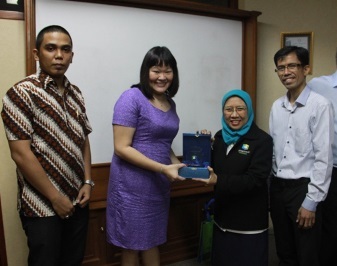 This milestone was presented to Perbanas Institute by CPA Australia’s Accreditation Consultant on Education Policy, Mr Ron Wooley, and its Indonesia-based Business Development Manager on Education, Ms Decy Teh, as representatives from the organisation. Perbanas Institute is committed to its mission of becoming one of the top 5 most reputable banking education institutions in Asia and has undertaken several approaches to reaching this target, as is laid out in ‘Vision 2019’. This recent accreditation is indicative of Perbanas’ ongoing efforts to garner international recognition in striving towards accomplishing its goals. Moreover, the certification is a prestigious breakthrough that can in part be attributed to the strength of the institute’s faculty, of whom many are senior leaders in global financial institutions.